Beautifully situated airfield in the Bernese Oberland (Eiger, Mönch and Jungfrau) amid unspoilt nature, breathtaking mountain scenery and glacier. Near Interlaken (Gsteigwiler) located with the Jungfraujoch top of Europe as a destination. Tickets and prices can be found here in our offers. 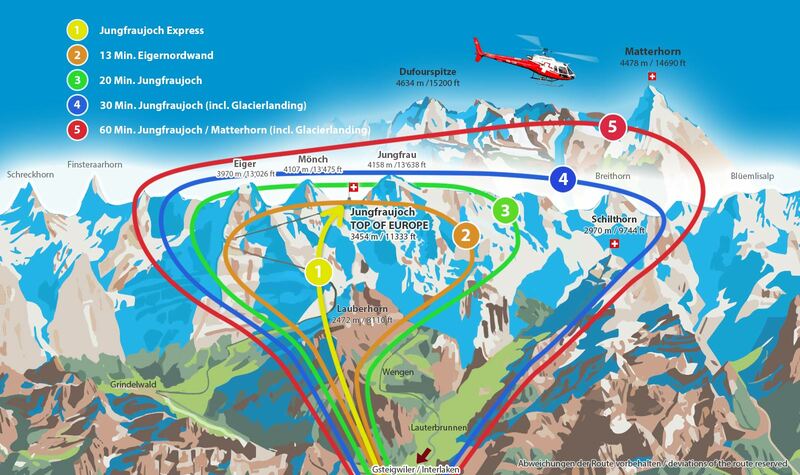 On request from Interlaken or Grindelwald Shuttlebus from Hotel return to the Heliport. Bookable 365 days a year! Call us +41 56 470 91 11 or info@helikopterflug.ch, because personal advice is important. VAT included. Shipping and handling included * Basel 5 Pers.